[keys id=129156]City of Steam is a full-featured, browser-based 3D MMORPG, transports players to an industrial metropolis that has fallen from grace. Emerging from the ashes of ages past, heroes versed in swordplay, divine harmonies, and the arcane arts seek their fortune in a world beset by countless foes, from dangerous factions to mechanical horrors. 1. After getting your Alpha key, head to the City of Steam website. 2. Register an account (or sign in if you already have one), copy/paste your Alpha Key, and click the register/sign-in button, then click on the ?Play Now? button and test out City of Steam?s Alpha release. 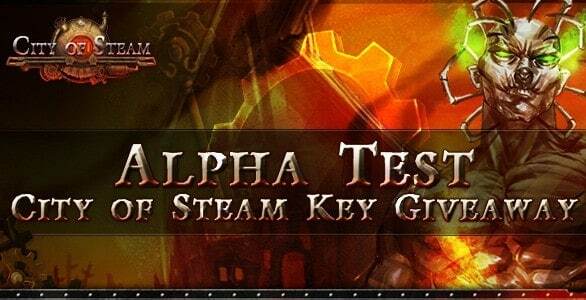 The Alpha test will run on the weekends of July 27-29 and August 3-5, starting on Fridays at 19:00 PDT (22:00 EDT) and lasting until Mondays at 00:00 PDT (03:00 EDT) Keep your key in a safe place if you?ve received one early. Alpha starts soon! Each weekend will be chock full of events and activities that will give players a chance to win cool swag and honorary titles. This is an Alpha version, so be sure to help out the developers by reporting bugs on the forum and getting into the strong community. City of Steam relies heavily on community-driven development which results from feedback from players like you! If you would like to support the development further and get some cool swag, head to the Support Us section of the website. Note: One account can only activate one Alpha key code.